Racer Rowing started celebrating MSU Homecoming with an Alumni vs. Varsity race in 2003. However, it was not until 2005 that the winning team was awarded the coveted Homecoming Cup. The original trophy was conceived by Michael Moode by hot gluing a plastic souvenir cup to a Hobby Lobby box. His original intention was that whichever team won the cup would receive “the priceless treasures placed within by whichever team won it the year before.” When the Varsity won the cup (captains Matt Weaver and Tracy Bogard accepted the trophy on behalf of the Varsity), it was filled with little Hearshy’s chocolates (originally, the plan was to fill it with cigarettes, little airplane-sized bottles of whiskey, and condoms—however, at the last minute, this plan proved to be too expensive and very likely to offend). In the years that followed, the trophy became less of a vessel to contain spoils of victory and more of a time capsule. Subsequently, an eclectic range of “treasures” have been placed within the box where they are to remain for all eternity. 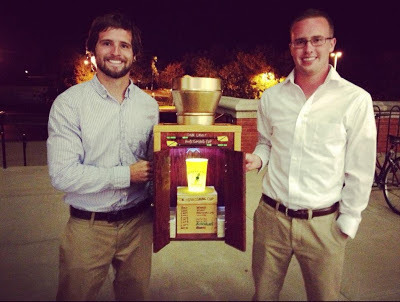 For eight years, the original Homecoming Cup trophy served us well. However, as the 2012 Homecoming celebration approached, it became apparent that its retirement was drawing close. We were running out of space inside to hide our precious heirlooms and we were running out of space on the front to document the winners of future alumni vs. varsity races. In the years since its introduction, some had called for a different, more elegant trophy. For example, Coach McLean went so far as to secure a beautiful silver bowl in proposing a new trophy. But no proposed replacement had the ineffable quality that made it feel right for Racer Rowing. The Homecoming Cup needed to be replaced with something very special. Jones and Neeley took to this task with a creative zeal that rivaled all of the previous marvels they had created for the team. "We were really excited about this. The hardest part about anything we do is coming up with the idea itself." said Neeley. They knew that taking up this idea required a certain level of responsibility to tradition. "We wanted it to look homemade, but professional." Carter commented; "So we broke up this task into two parts - the top and the base." Colin continued, saying they "... had ideas for days. Walking around Lowe's looking for materials was a big help." They informed me that there were multiple ideas for the cup on top. One idea was to get sheet metal and hammer out a cup or some sort of "gravy boat". "The cup was... the hardest part. We were walking down the duct work aisle in Lowe's and came across a reducer that went from an 8 inch width to a 6 inch width. We thought that would work, and it did!" Colin said. "It was the most important part too." Carter continued, "We wanted it to resemble the old trophy in a way." The base of the trophy was much more straightforward. "We wanted to go with a mahogany and gold color scheme." Colin noted. They constructed the cabinet out of plywood, keeping in line with the well built sturdiness of the original trophy. Of course, the new trophy did have some new features. "We lined the trophy with mini oars, one for each year, and a few extra for the following years." Colin said. "Over time," he continued, "those oars will represent a significant event for that year, which will be drawn onto the blade." The blades themselves are made out of dowels and tongue depressors, and are each hand painted. But that wasn't the hardest part of the whole build. Upon inquiring on what the hardest part was, both Carter and Colin grinned and let out a laugh. "The hardest part was keeping it hidden from everyone." Colin said. Carter continued, explaining that "Since Colin and I don't live together, it's not like we can hide it in a closet or in the house or anything like that. We hid these parts all over the place. The gear locker with the padlock in the erg room? We hid parts in there under the piles of spandex. Nobody noticed. We hid parts in the rowing truck in a shoebox. Nobody knew." Colin added, "We had to work around people's sleep schedules." he added. Upon completion, they sent Moode some teaser photos of the original trophy being lit up by the light inside the new one. The resemblance to the early run of the Batman Begins movie trailer was uncanny. After very little deliberation and unanimous consent Jones, Moode, and Neeley decided to name the new trophy after our friend Dan Lavit, not only for all he has done for the club in general, but for all that he has done to make our Homecoming celebrations memorable regardless of who wins the Alumni vs. Varsity race. The trophy really is a work of art. I's so proud and honored that it bears my name. Dan, I hope to one day place your ashes in that box---and that it still serves as our Homecoming Trophy for generations to come.